SHENZHEN, China -- From where he sits in the Haxlr8r office in Shenzhen, China, Yaroslav Azhnyuk can see a 10-storey building that houses only LEDs. Next door to that, there’s a building of the same size just for IP cameras. All throughout that part of the city, which 30 years ago was a sleeping village before China’s government declared it a special economic zone, there are buildings full of gadgets, widgets, electronics, machinery, plastic parts, and whatever else a hardware startup could possibly need. Just down the road, there are factories that can put products together at massive scale and in short order. “These are the things that are not possible in any other place in the world,” says Azhnyuk, whose startup Petcube is halfway through Haxlr8r’s hardware accelerator program. Petcube’s team is from Ukraine, but just prior to entering the accelerator it moved to San Francisco in order to reach the US market. The company, like Haxlr8r classmate Hex before it, is a Kickstarter darling, having already raised $150,000 with 24 days to go in its crowdfunding campaign. Its initial target was $100,000. The Petcube is a smart cube through which people can communicate with their pets remotely. So, if you happen to be away from home and you’re a Petcube owner, you can use Petcube’s smartphone app and talk to your cat back home via the cube. You can also take pictures or videos of your cat, and get it to chase around one of those little laser lights that cats just can’t resist. And, yeah, apparently that laser trick works without fail. 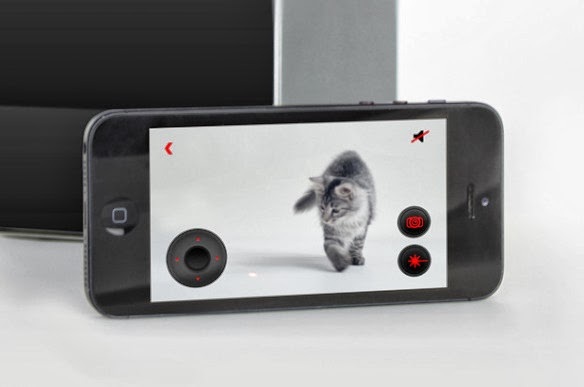 “It works for every cat and every dog of small and medium breed I have ever seen,” says Azhnyuk, who is Petcube’s CEO. If you’re feeling generous, you can let your friends access your Petcube through the app, too, or you could tap into Petcubes placed at animal shelters. Azhnyuk envisages Petcube as a way for potential pet owners to check out dogs they might like to adopt without first having to visit a shelter. Petcube is the work of three founders who met while working at an ad agency in Kiev. Petcube’s CTO, Alex Neskin, the CTO, first came up with the idea while working at the agency because his pet dog, Rocky, would start barking and scratching whenever his owner went to work. It got so bad that the neighbors would call the cops. So Neskin set up an arduino board and a small camera so he could see what Rocky got up to while he was away. Noticing that Rocky craved any kind of attention, Neskin later added a laser pointer, which could be manipulated through a Web interface, so he could play with the dog. And so Petcube was born. Knowing that the Bay Area is the tech capital of the world, the Petcube team quickly determined that it should move to San Francisco, even while it retains a team of developers in the Ukraine. The guys also knew they wanted to take on funding at some point to help get to market, and they ultimately decided on entering an accelerator program. They considered Boston’s Bolt, whose partnership with Dragon Innovation gives it connections to China’s factories and supply chain, but ultimately decided they wanted to base themselves in Shenzhen, just over the border from Hong Kong, while they got the product ready to ship. At Haxlr8r, Petcube gets $25,000 in seed funding, office space, and mentorship. The startups within it work towards a demo day in San Francisco on November 21. On that day, Petcube will be competing with Hex, makers of an smartphone-controlled nanocopter, for bragging rights. On the financial front, however, Hex has an advantage. Its Kickstarter campaign, which ended yesterday, netted $560,000. It’ll be extremely tough for Petcube to top that, even though it has 25 days left and stretch goals that include autoplay mode and motion detection sensors. While Kickstarter success is not real-world success, Haxlr8r must be smiling. On the strength of Hex and Petcube’s initial promise, Haxlr8r is proving itself an accelerator to watch. Not everyone is bullish on the idea of a hardware revolution, but if it does happen, perhaps it will take place in Shenzhen.